Have you read the book The China Study? It’s the one my friends cite as the reason they don’t eat anything with a mother, no dairy etc. The theory is that protein allows cancer cells to grow. It’s pretty extreme to me, but now alas I think about it when I eat yogurt. Any opinions from you? Science shows that ingesting animal products causes inflammation in the body. So does eating anything charred or burned (whether meat or vegetable). Low quality meats (corn-fed, hormone and antibiotic injected) are the worst. Sugar also causes major inflammation. Sugar, cooked foods and most animal foods are more ‘acidotic’, and release free radicals; free radical cause cellular damage, think premature aging and cancer. 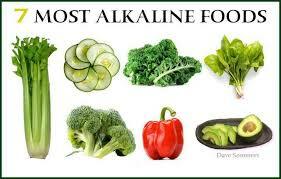 Alkaline foods (almost anything green–see chart) can heal that damage. Alkaline foods can neutralize the cancer-causing free radicals. Some folks think if you just eat 51% raw foods you’re fine. Every time we eat, it’s an opportunity to cause cellular damage or heal ourselves. I’m probably a Nutritarian, meaning I try to make each meal as nutrient rich as possible.